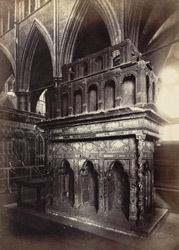 "This once magnificent, and even now in its neglected condition, splendid shrine, occupies the centre of the Chapel of S. Edward the Confessor, immediately to the East of the Hight Altar. It was erected by Henry III., on the occasion of his re-building the Abbey Church; and was finished about 1269, under the superintendence of Peter Cavalini, a Roman sculptor. Portions of the curious and sumptuous mosaic work with which it was covered still remain. The top was once surmounted with a splendid tabernacle. The present incongruous woodwork was erected by Abbot Fakenham, when the shrine was restored by Queen Mary. Henry III. lies buried in this Chapel under a mosaic tomb and canopy, the work of W. de Torelli, and there are several other royal tombs: also a brass to J. de Waltham, Bishop of Salisbury, who died A.D. 1395. Edith, the wife of S. Edward, was also buried here, but has no monument." Westminster Abbey was founded by Edward the Confessor and was consecrated in AD1065. It was rebuilt in the 13th century in the French gothic style, with a nave of great height, flying buttresses and rose windows. The monastery was dissolved by Henry VIII in 1540 and the abbey became the cathedral of the new diocese of Westminster. The abbey is crowded with tombs and monuments to churchmen, scientists, writers, politicians and nobility.